Well, I’m back. Tucked safely away in my little apartment in Arlington, VA, enjoying powerful air conditioning and Mexican food. It feels about as far from Cambodia as possibe. Except for the humidity. That is exactly the same. Maybe even worse. Way to go, Founding Fathers, way to build the nation’s capitol in a semi-tropical swamp that doesn’t even have awesome ruined temple complexes. 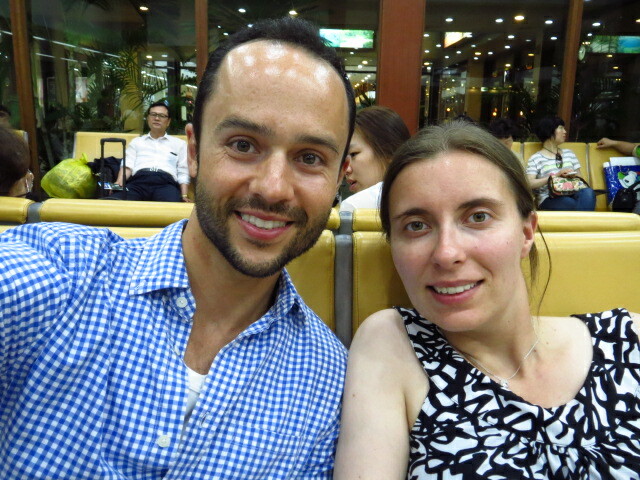 In the airport at Siem Reap, Cambodia. As with the outbound trip, the flights were uneventful. Unless you count the sighting of beadazzled men’s Birkenstocks as an event (which I do), in which case that totally happened. It’s too bad that I’m feel so inhibited about taking pictures of people while they’re sitting across the aisle from me in the airport looking at me, because then I could insert a photo here of the outfit. Instead, you’ll just have to imagine a polka-dotted button-down shirt, billowy hippie pants in an outrageous elephant pattern, and Birkenstocks covered in jewels. All of which was in an understated navy-blue-and-white color scheme, because obviously when you have that much going on, something has to stay under control. It’s an outfit that would never fly in the United States (at least, not unless the guy wearing it was okay with everyone assuming that he was flamboyantly gay). But on a slim, wealthy-looking, twentysomething Korean man, it actually worked. That’s one of the things I like about traveling — you get to see what men can wear in societies that don’t have such rigidly defined notions of masculinity that dudes get judged for wearing something other than flipflops, cargo shorts and a t-shirt. In fact, it was interesting to see the difference between what the Koreans (men and women) wore on the flight from Cambodia to Korea, and on the flight from Korea to the US. On the first flight (where, presumably, you had more Koreans who were planning to stay in Korea), people were wearing lots of really bright colors, with funky patterns and cuts and everything from sequins and pearls with high heels to what I can only assume were body suits that were meant for bobsledders. On the second flight (which was equally full of people who looked Korean, but which probably had way more Americans than the other flight, and where, in any event, everyone was going to the US), the styles and colors were far more subdued, conservative and boring. Makes me want to get out of the airport and see what people wear in the streets in Korea. Another observation about the Koreans? They’re astonishingly good at standing in line and being orderly when it comes to boarding the airplane. I mean, when put in large groups inside a ruined temple, they’re a complete nightmare almost as bad as the Chinese for being pushy and obnoxious. But give them an airport terminal and a boarding time and they’ll line up like straight-A students. Which actually worked to Vanessa’s and my advantage. Vanessa took one look at the long line of Koreans snaking down the terminal from our boarding gate door and said something to the effect of, “I’m sorry, but I am French today; I am not waiting in line.” Part of me wanted to point out that this was how society breaks down (just try getting through any of the Paris airports and you’ll know what I mean); but the other part of me was all, “Ouais, c’est clair. On y va!” For better or for worse, that second part won out, so we both cut right to the front of the line and were on board and seated in no time. The next fourteen hours or so are a blur of reading snarky memoirs and watching sappy romantic comedies and surprisingly boring thriller movies, with periods of sleeping interspersed throughout. At one point I woke up enough to think, “Shouldn’t I do something more useful with these 14 hours than just sit here judging the man in front of me for watching the GI Joe movie, like, 87 times in a row?” So I tried to be all introspective and thoughtful, hopeful that I’d reach some new insight about myself and/or make a few important Life Decisions. But the problem with making Life Decisions while in a jetlagged stupor in the middle of a trans-world flight is that you are not Paul Rudd in a romantic comedy with Tina Fey, and so “adopt an orphan boy from Africa and teach animal husbandry at a private liberal arts high school in New England” is just never going to be the right answer. What I should have been doing instead of making Life Decisions was monitoring the blood circulation to my lower extremities. Because sometime around the 12th hour I looked down at my feet and was horrified to see nothing but CANKLES AND SAUSAGE TOES at the end of my legs. Which, btw, I don’t normally have. I’m not sure if it was the effect of gravity or prolonged seated inactivity, or just karmic reward for cutting in line to get on the plane, but basically all of the blood in my body was down in my ankles and toes making me look like an eldery woman who needs compression hose. I considered turning around in my seat so that my feet were sticking straight up into the air and my back was on the seat, but I didn’t want to get yelled at by the flight attendants (not that there’s anything in the opening presentation that says we can’t sit like that). Plus, it was probably too late anyway. So instead of deplaning into the DC airport with the alluring air of a well-tanned, ruggedly handsome scruffy traveler, I had to resign myself to deplaning with the air of a well-tanned, scruffy traveler with cankles and sausage toes sticking out of his Birkenstocks. But since my Birkenstocks didn’t have any jewels on them, maybe people wouldn’t be looking down there anyway. And on that note, I’m off to bed. I’m kind of dreading going back to work tomorrow and digging out of emails and backlogged projects, but overall it will be nice to get back in the routine. I guess that’s what vacations are for. I’m hoping that things won’t be too busy right off the bat so I can go back and fill in some gaps in the blog for portions that I didn’t have time to write about during the trip. I don't know… “adopt an orphan boy from Africa and teach animal husbandry at a private liberal arts high school in New England” sounds like a good answer to me…. Ahah, and of course you didn't take any photos of the cankles? Seriously, bedazzled cankles…you are no fun….but I'm going to label this post “Punchy Jason” which is my favorite Jason by far. He is related to Punchy Joyce who is also funny when very tried. And for the record, the cankels are a Wilson thing. Yes, you get them on round the world airplane flights, but also as you get older…thanks Grandma Nell! (I say that as I stare down at my own cankles this very evening.